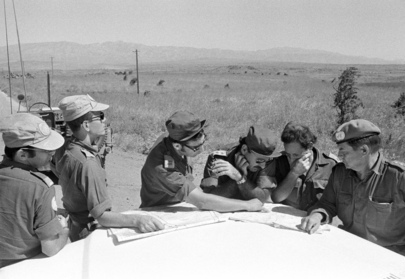 Seen here on the Quneitra-Sassa road discussing the location for Phase 2 FRA are (l. to r.): Col. Simcha Maoz, Israeli Liaison Officer with UNDOF, Maj. Ossi Tihula (Finland). S.S.O./FHQ; Col. Tauno Kuosa (Finland), Commanding Officer UNDOF FHA; May. Gideon Neuman of the Israeli Armed Forces, and Maj. Ekkewin Bauer, C. Ops. O (Austrian Battalion).